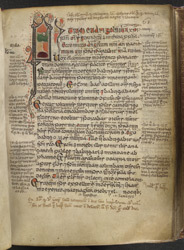 Although the main text is in Latin, there are a series of added notes in Irish at the end of each Gospel which provide the scribe's name: Mael Brigte Ua Mael Uanaig; his age: 28; the fact that he was writing in Armagh; and the date of completion: 1138. In the 13th century further academic notes were added, which suggest that the book was used for study in the new university of Paris. The text on this page is the start of the Gospel of Mark, beginning 'Initium evangelii . . .', the opening letters 'In' being formed into a monogram, following a tradition dating back to the 7th century in Irish manuscripts.